Today was the final performance of "Cinderella Samba" at the SP Recreation Center. 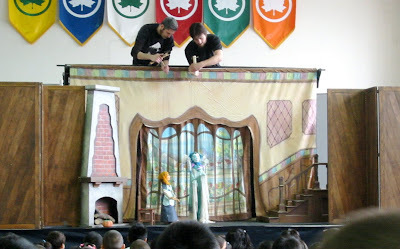 It's presented by the Swedish Cottage Marionette Theatre usually located in Central Park. Since I am the queen (or maybe duchess) of free programs, as soon as I found out about it, I called to reserve my spaces. We arrived almost 45 minutes early for the 10:30 AM performance, and we ended up in the front row with a few other Moms, care-takers, and kids. Around 10 AM the school groups started to arrive. Let me tell you, I'm used to high school kids, and these kids were WELL-BEHAVED. In fact, the little boy directly in front of several moms with babies and toddlers from eight to eighteen months was patient to the point of being angelic. Once the show began, I think the adults were more rapt than the children, but it held their attention for the entire almost 60 minutes. Only the ballads were a tad trying on the babes' and elementary schoolers attention spans. It's a great program for the communities it visits. I was really surprised how relatively few parents and caretakers took advantage of the show. Perhaps it was an advertising issue, perhaps, especially in this area, it was a language issue. Well, I had fun. I love marionettes, and I love free stuff. And my pseudo-angelic child was pretty cooperative with the assistance of some Oatios.